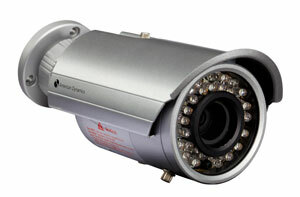 MESSOA has just launched their newest, superior infrared CCTV camera known as the SCR368. The SCR368 has a 164-foot view range which can capture sharp images even in the dead of night. The SCR368 is enhanced with Lumii III, the latest in image enhancing technology, and is able to make images look sharper and more clear than your traditional cameras. The SCR368 is a high quality CCTV bullet camera that is equipped with with a 1/3″ Sony Exview HAD CCD II which is able to reproduce 700 TV lines of image clarity. The Lumii III technology allows you to display first rate 12-bit images as well, which enables the camera to deliver representation of the detected images that is sharper and clearer than your conventional camera. The SCR368 also comes with a 6mm~50mm vari-focal lens which allows more flexibility for your camera placement and also gives you a wide coverage area. This camera uses a maximum of 7 watts of power which makes it fairly energy efficient and a single light control reduces power usage by 30% to 40%. In addition to that, IR LEDs do not always need to be on during nighttime surveillance which extends the life of your LEDs. The SCR368 also comes with a superior IR LED design which is designated to reduce IR disturbance. IR reflection is prevented which allows you to have a wider variety of installation locations. The SCR368 is also equipped with an IR corrected lens in order to remove focus shift problems when switching from day to night recording modes. This camera also comes with an IP-66 rated housing allowing it to be extremely resistant to weather elements that may damage other cameras. It is also protected against vandalism and tampering. If you are in the market for a durable, high-quality CCTV bullet camera, look into the SCR368 from MESSOA. It has a lot of great features that will work well in any situation. Put your eye on the problem with Camera Security Now, installing security cameras since 1999. We install in the US and we can help you do it yourself. Call us toll free 877-422-1907 between 8am EST and 5pm PST M-F. Talk to an expert about your serious security camera needs. American Dynamics, which is a part of Tyco Security Products, recently announced an expansion of their analog camera line with the addition of the Discover 200 and Discover 600 Series of cameras. The Discover Series is comprised of both mini-dome cameras and bullet cameras that are capable of handling a wide variety of situations and applications. One of the best things about the Discovery Series of cameras is that they both offer exceptional quality and performance with the added benefit of being extremely affordable. Both the 200 Series and 600 Series offer excellent image quality in a variety of different lighting settings which makes them great for areas with varying light conditions, indoors or outdoors. The 200 Series Bullet Camera offers day/night switching with a built-in IR illuminator and also switches from color to black and white in low light settings. The mini-dome camera features an auto-sensing power that comes with a wide array of mounting accessories. The 600 series bullet camera includes day/night functionality, 3x vari-focal IR corrected lens, IR illuminators and an IP 66 rated housing system. The mini-dome has most of the same features as well as an IP67 rated housing. Both the 200 Series of cameras as well as the 600 Series of cameras are available now through American Dynamics’ worldwide distribution channels. This new line of bullet cameras from Supercircuits includes a bunch of advanced performance-enhancing features including: built-in UTP, built-in on screen display, digital noise reduction, digital slow shutter and digital wide dynamic range for advanced backlight control. Each and every camera in the new SC Black range features 600 lines of resolution, a 2.8-12mm varifocal lens, dual voltage 12VDC/24VAC and a five year warranty. A tri-axis mounting bracket is also included standard to allow for easy installation on walls or ceilings. Each model features a durable IP67 weatherproof construction as well as a built-in heater which allows the camera to operate in temperatures as low as -20 degrees F. The built-in heaters also act as a built-in defogger and allow the camera to function in as much as 95% humidity. The concealed OSD as well as the spot video out compartment, both of which are tool-free, eliminate the need for a remote control to adjust camera tuning. The watertight compartment also reduces the need for multiple installation tools which results in a faster camera adjustment job as well as faster installations. This new line of cameras also features auto-adjusting IR arrays which automatically control the infrared strength in order to eliminate IR washout on objects close to the camera. This array also adjusts the infrared strength to illuminate subjects as they approach the camera so that their features remain unobstructed. The BLK-CPT237VH and BLK-CZT242VH models both feature a small adjustment knob in order to lengthen and narrow or shorten and widen the IR array field of view. Features of the new cameras include: 1/3″ Sony Super HAD II CCD chipsets, 600 lines of resolution, auto-adjusting IR arrays, True r digital day/night options, 2.8-11mm – 5.0-50mm varifocal lenses, dual voltage 12VDC/24VAC operation, IP67 weatherproof construction, tri-axis mounting bracket and a five year warranty.